TEA AT FOUR. DINNER AT EIGHT. MURDER AT MIDNIGHT. In 2001, Robert Altman (MASH, The Long Goodbye) took the unexpected step into Agatha Christie territory with Gosford Park, a murder-mystery whodunit set in an English country house starring a host of British acting greats and with an Oscar-winning screenplay by Downton Abbey creator Julian Fellowes. It would become a huge success with audiences and critics alike. 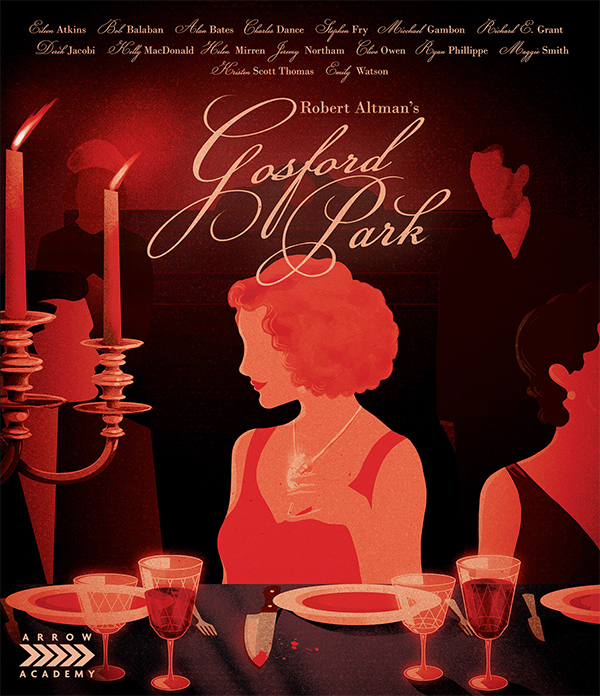 Set in 1932, the action unfolds during a weekend shooting party hosted by Sir William McArdle (Alan Bates), and his wife Lady Sylvia (Kristin Scott Thomas) at his estate, Gosford Park. Among the guests are friends, relatives, the actor and composer Ivor Novello (Jeremy Northam), and an American film producer (Bob Balaban). When Sir William is found murdered in the library, everyone - and their servants - becomes a suspect. Also starring Charles Dance, Michael Gambon, Richard E. Grant, Helen Mirren, Clive Owen, Maggie Smith, Emily Watson and many more, Altman produced another masterpiece deserving to be ranked alongside Nashville and Short Cuts as one his finest forays into ensemble drama.